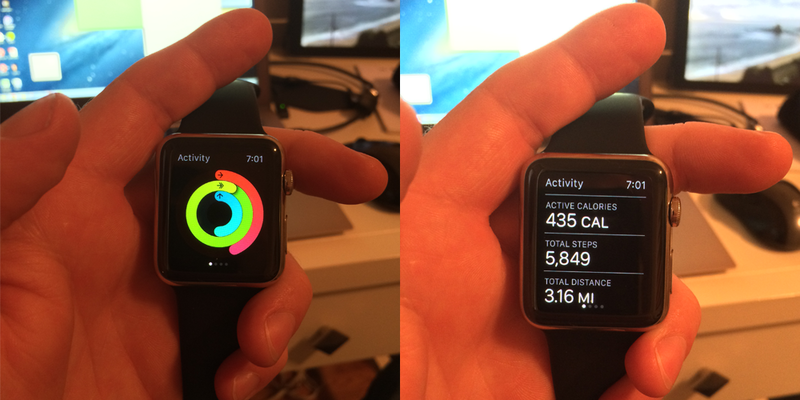 I purchased an Apple Watch specifically to test out the activity tracking features. I didn’t care that the cheaper sport models were all sold out (I wound up with the 42mm stainless steel), because I planned to return it after playing around with it for several days. Having done so, I am sticking with the return plan. I was never bullish on the Apple Watch to begin with because of the 12hr battery life. While I’ve found that it usually gets through the day, the watch simply doesn’t provide enough utility to justify charging a second device every night. This is exacerbated when traveling, where the inductive puck with ~6ft cable can be cumbersome, in addition to the need to pack a second AC to USB adapter if you want to charge it alongside your phone. I think the max recharge rate for a mainstream consumer wearable is once per week, and even then, all my friend’s Pebbles and FitBits have ended up dead in a drawer somewhere. If my FitBit Flex didn’t reliably last for 7 – 10 days, I’d probably have dumped it too. The only activity feature of the Apple Watch that really jumped out at me is that it displays just the calories burned through motion, unlike FitBit products which also lump in the calories your baseline metabolic rate consumes. I cannot understand why FitBit insists on bundling baseline calories into daily expenditures, which makes it impossible to see the calories you’ve burned purely due to activity. Unless they’re concerned that users might drop dead before the end of the day – in which case, fitness trackers are the least of their worries – the app should show you only the calories burned due to motion, and then add in a days worth of baseline calories latter on. At the very least, it should break out calories due to movement separately, so that I don’t have to back-out my baseline rate, multiply that by the number of hours since midnight, and then subtract that product from what the device is showing me just so I can determine if I still need to go to the gym after that long walk to work. 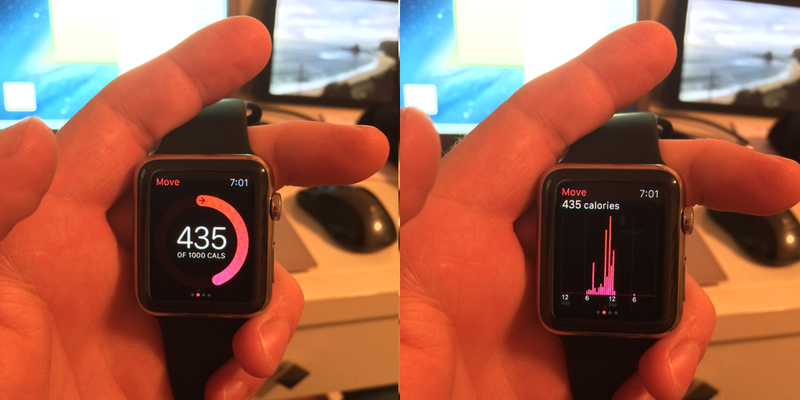 The UX team at FitBit should take note of Apple’s common sense approach here. 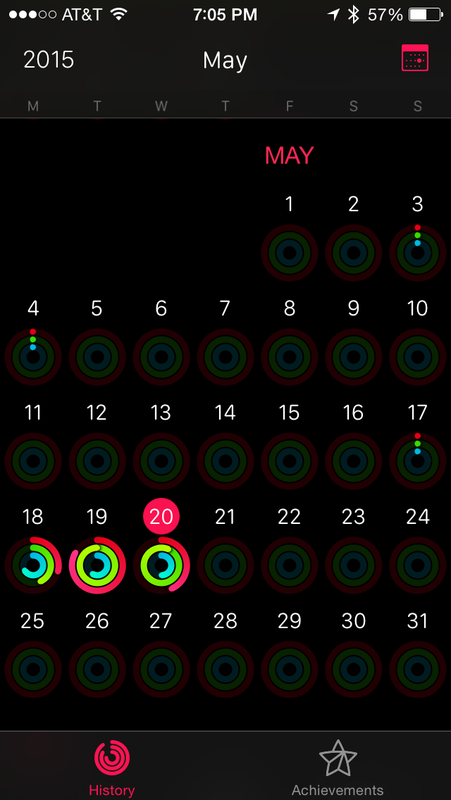 I’m not a big fan of Apple’s visualization for activity, particularly because I don’t care about the metric represented by the innermost blue ring – the number of hours in which you stand for at least 1 minute. By default, the Apple Watch comes with the reminder to stand turned ON, which notifies the user if they have yet to stand up in the last 50 min. Even assuming that this practice provides real health benefits (I’m skeptical), I can’t imagine that anyone could endure hourly notifications for more than a day or two. Like many broader Apple Watch features (Lookin’ at you, creepy animated emojis), this seems like an idea that looked good on paper but flops in reality. Swiping left from the Activity rings brings you into separate screens for calories, minutes of exercise, and hours in which you stood. Scrolling down from any of these three screens shows a bar graph over time, as seen above. Pretty, but there’s no innovation here. 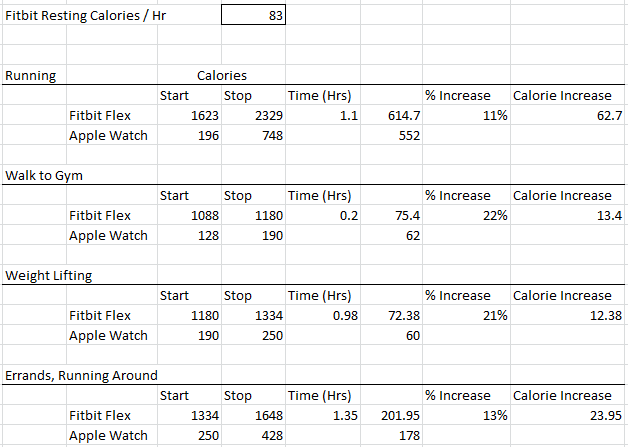 I did want to compare the calorie expenditure calculated by the Apple Watch and my FitBit Flex, which I do in the spreadsheet below. All height and weight inputs were the same. Compensating for the underlying metabolic rate built into the FitBit Calorie expenditures ( I found mine to be 83 cal / hr by taking the device off and leaving it on a desk for an hour), I found that for a variety of activities the FitBit showed 10 – 20% higher calorie expenditures. This could be due to the fact that the Apple Watch has a built in heart rate sensor, and my resting heart rate is very low at ~48 bpm. So if the FitBit Flex (which lacks a heart rate sensor) has algorithms which assume a heart rate along the lines of the population average ~75 bpm, the Apple Watch’s measurement of a much lower HR value during resting periods could bring its calculations down versus the Flex. This is supported by the fact that the difference is the smallest (11%) during the activity in which my heart rate is highest (running). Sure, a month’s worth of concentric circles might look cool, but it can’t possibly be better at showing data over time than a simple bar chart like the FitBit app has. But maybe this is what consumers want…. I wouldn’t know, I’m an engineer, not a marketer. Finally, I don’t think the physical packaging of the device makes sense for very active people. It’s quite thick, which means that it extends off the wrist and bumps into things and scratches. I don’t mind when my FitBit gets banged up, as can always get a new band for $8 on AMZN. But when I scratching the front of my $350 smart watch, and then have to look through those scratches to access apps, etc on a daily basis, I doubt I’m going to be wearing it anywhere active.